I'm happy to report my peppers are doing well. Approximately a week ago, I discovered the buds on the plants had flowered. Small white flowers with purple centers. Absolutely beautiful to me - and encouragement for my fiance (who can't wait to eat a pepper). 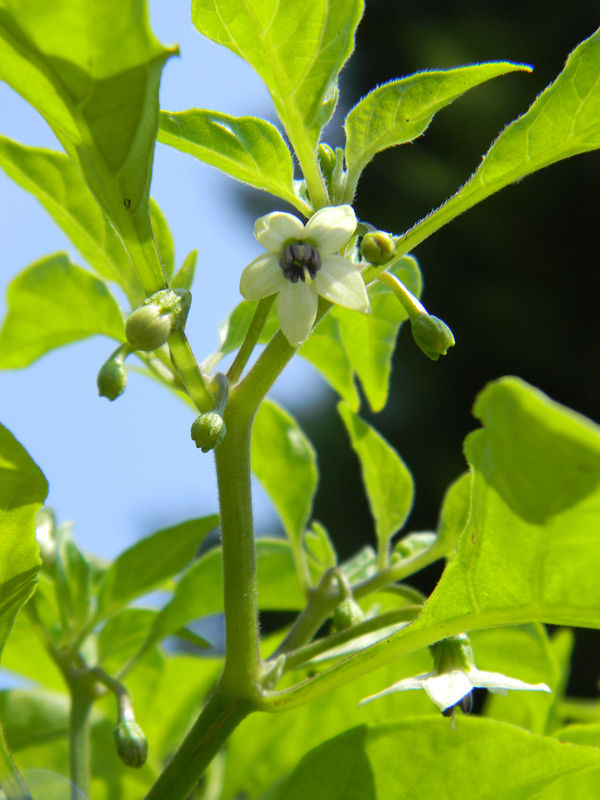 A few of the petals have fallen off now, so I am watching daily for signs of pepper growth. Bhut Jolokia is slow growing - so patience is key. I'm starting to see evidence of a "potential" pest problem. Not sure if that IS the problem...but it's worth keeping an eye on. (These plants can be susceptible to such pests as aphids, etc.) I read today a light dusting of powdered lime will prevent most insects. If it is an aphid problem (this bugs are known to carry other viruses), then a mixture of common household liquid soap, water and cooking oil sprayed on them should do the trick. It also suggests using a heavy spray from the hose to remove them, but that would disturb the pollen (that helps to create more peppers). Only time will tell. I don't plan on letting ANYTHING ruin these peppers...unless it's out of my control. And if it's pests, they've had a bad day. 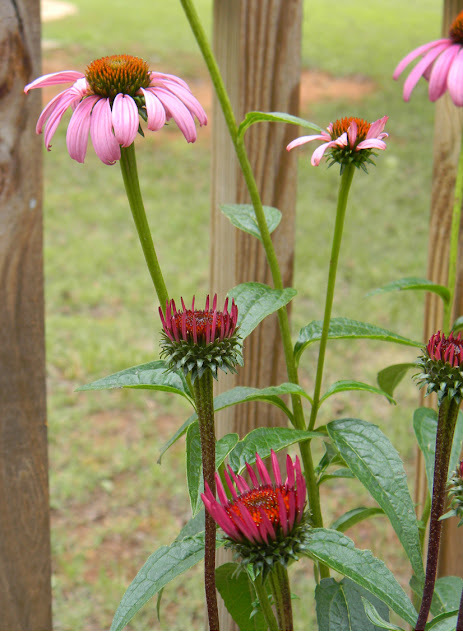 The fuschia pink echinacea plant is starting to open up and it's as beautiful as I expected. Such a contrast from the typical lavender (Magnus) version. I couldn't be happier with the results. When the greenhouse is up and running, these plants will be in the ground and I will add more colors to the two I already have. Maybe a Paradiso Mix from Burpee. The Citronella plant is growing like crazy! I'm glad I went ahead and purchased a "tomato support" while I was buying the plants. The foliage is beautiful and the scent is great. 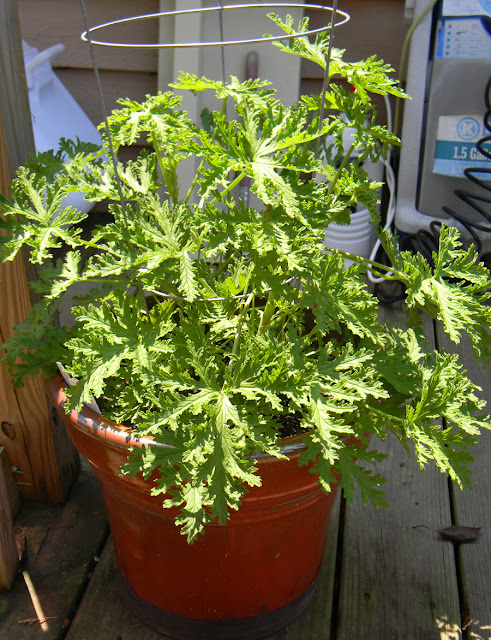 When I water this plant, the whole porch smells like citronella! Last Friday, I received a fabulous mail art package from Jessica Gowling. (see previous blog) I returned the favor by sending a package back to her today. I'm rather proud of the handmade envelop (made from an old poster - circa 2005). I also was able to pick up some cool stamps to add to my next mail art packages. After all, you can't send a homemade envelop and have it plastered with a postage label! Canada is currently in the middle of a postal strike (and it has made it to Jessica's area). I hope she receives this package soon - I don't think I can wait to hear what she thinks of it! Until next time - Happy Gardening and don't forget to send someone a handwritten letter. It really can make their day! So excited to see what you have in store for me. Sorry again about the strike. hopefully your lovely handmade envelope arrives before I leave on July 6th. If not, I will be SO happy to discover it when I come home... all the best.